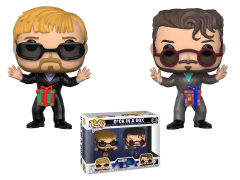 Characters from some of SNL's famous sketches are coming to Pop! The D*ck in a Box duo can now be yours with this SNL 2-pack, New York guide Stefon, and "more cowbell" Gene Frenkle! Pop! figures bring your favorite TV characters to life with a unique stylized design. Each vinyl figure stands 3.75 inches tall and comes in window box packaging, making them great for display!